No doubt there are some fine gardeners who will defend growing T.coccineum (Painted Daisy) as a worthwhile horticultural experience, but the fact is that painted daisies usually transform quickly into floppy wrecks of the high maintenance (staking, hooping, shearing) variety. Luckily, the plant is often short-lived. 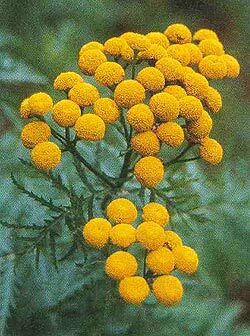 Both T.parthenium (Feverfew) and T.vulgare (Tansy, Golden Buttons) are much finer specimens for the northern garden, and are further exonerated by performing reasonably well in part sun conditions. Feverfew grows best in full sun. Any well-drained soil is suitable. Very fertile soil may encourage invasive growth. Plants bloom from mid-summer to fall. Deadheading will prolong the blooming period—one can expect bloom well into September. Divide in spring as needed to control spread and maintain plant vigor. TipsUse feverfew in borders, rock gardens, wildflower gardens, cottage gardens and meadow gardens. Most of these species are quite civilized, but T.vulgare can become invasive. To control invasiveness, grow the non-invasive ‘Crispum’ or grow the species in planters—they’re a dandy container perennial. These plants are generally pest free, but keep an eye open for aphids.